On the eve of Cannabis legalization in Canada, the Early Psychosis Intervention Ontario Network (EPION) is launching a new MyCannabisIQ campaign to educate clinical staff, families, and young people about the risks involved with cannabis use. Cannabis legalization poses a significant risk to youth under 25 years, particularly those who are vulnerable to or have already experienced psychosis. There is considerable evidence linking cannabis use to psychosis. Teenage marijuana use can induce psychosis several years later. Full recovery from psychosis is possible, but the outlook is more hopeful when young people stop their use. 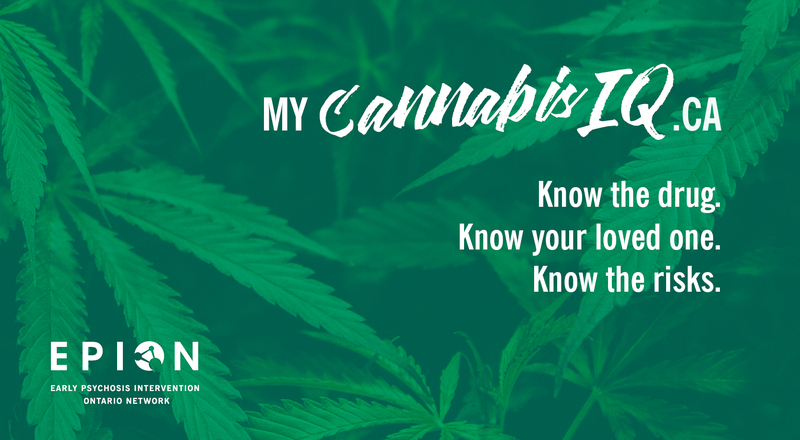 MyCannabisIQ is an initiative championed by EPION’s members to help youth, families, and clinical staff stay in-the-know about cannabis, its side effects, and the risk factors to keep in mind. Three MyCannabisIQ resources have been created to educate clinicians, families, and clients on important topics related to the legalization of cannabis. Particular emphasis has been placed on EPION’s role in helping to prepare stakeholders for productive conversations with youth about cannabis use in hopes of reducing the potential negative outcomes of cannabis use on recovery. Print copies have been distributed within EPION’s member programs within Ontario, with plans for creating additional resources for different target audiences in the coming months. The MyCannabisIQ initiative is complemented by a standalone microsite (mycannabisIQ.ca). The website echoes the key messages of the print materials while allowing for more interactive content and a full clickable reference list. Readers are encouraged to share their own lessons learned on social media by using the hashtag #mycannabisIQ and/or tagging EPION (@help4psychosis) on Twitter. EPION is a network of people who work in early psychosis intervention (EPI) services in Ontario, individuals who have received EPI services, and their family members and caregivers. EPION helps strengthen early intervention services across Ontario and support the implementation of the MOHLTC’s Early Psychosis Intervention Program Standards, released in May 2011. EPION is funded by the Ontario Ministry of Health and Long-Term Care. To learn more about EPION and this campaign, visit: help4psychosis.ca.